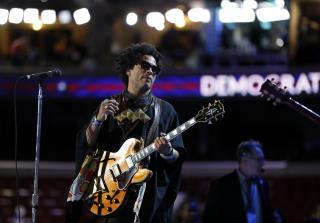 (Newser) – Angela Bassett and Sigourney Weaver, Empire producer Lee Daniels, and rocker Lenny Kravitz are providing the celebrity power Wednesday on Day 3 of the Democratic National Convention. Weaver introduced a climate-change film by director James Cameron, "Not Reality TV," featuring Jack Black, Don Cheadle, America Ferrera, and the party's presidential nominee herself, Hillary Clinton. "We made this film to show the reality of climate change—how it's directly affecting millions of people each day," Cameron said in a statement. "As I've said before, to save our planet we need to mobilize like we did during World War II—the threat to our country and children is that severe." The busy midway point for the Democrats comes after a surprise performance by Kesha at an invitation-only gun control concert Tuesday night in Philadelphia, reports the AP. All the stars or "fake people" that don't have a clue as to the lifestyle of the Average American lifestyle. All liberals are starstruck and validate their existence by how many famous people they know. I think it's inappropriate for political conventions to host celebrities, the RNC and the DNC do so hoping their fans will accept their opinions rather then have their own. Just more biased partisan hacks who aren't going to get any money from me.